Webb Designs Italy 150th Anniversary Poster, presented to President of Italy, Giorgio Napolitano. 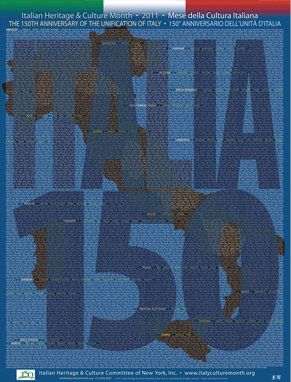 Webb's VP John De Santis created a poster to mark the 150th Anniversary of Italy's unification for the Italian Heritage & Culture Committee of New York. This poster is also partly sponsored by the Italian Consul General of New York The President of Italy received Rovere;'s Italy's 150th Anniversary Poster at a private reception held for the President on Sunday, March 27, 2011 at the St. Regis Hotel, in New York City. The President, observed all of Italy's towns, cities, provinces and regions on the poster and of course, was proud to see his own Regione di Campania as he looked carefully at the poster.The poster features listings of all Italy's 20 regions, 100+ provinces and 8,000+ towns and cities.